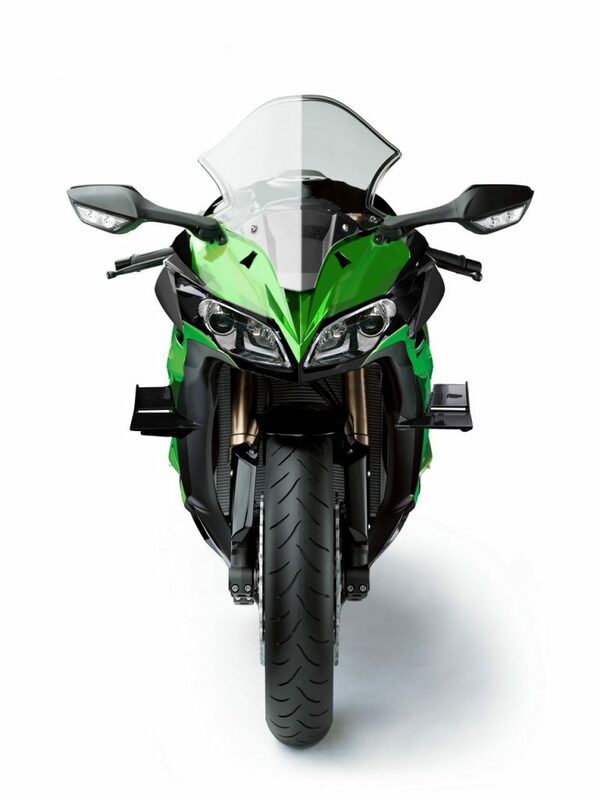 This could be the closest glimpse we’ve yet had at the next-generation Kawasaki Ninja 1000. No, it’s not a real photo but it’s a computer-generated picture derived from patents that appear to relate to the new Ninja. According to the Japanese journalists at Auto-By magazine, where this image was made, the new bike is likely to be an update of the existing Ninja 1000 rather than a completely new model, but with significant changes to the styling and technology. The most notable aspect of the appearance is the addition of H2-style winglets on either side. These will presumably add to the bike’s stability and front end grip, just as they do on their MotoGP equivalents. Technical updates are likely to include changes to the injection and exhaust to meet forthcoming emissions regulations, as well as updates to the rider-assistance technology to ensure the bike stays on the cutting edge. Japanese rumours suggest that the naked Z1000 will also be revised, and that the range will gain a new retro-styled derivative called the Z1000J. Read more about Kawasaki’s plans in the next issue of AMCN.